The results of the 2017 WIA Board election process were announced on 31 March on the WIA website. The announcement is reproduced in this issue of AR. Only one incumbent Board member was re-elected: our current President Phil Wait VK2ASD. The current Board members’ tenure concludes at the end of the Annual General Meeting (AGM). The new Board’s tenure commences at that time, but effectively at the first Board meeting after the AGM – I am guessing perhaps that will occur on either Saturday afternoon or Sunday morning. I am sure that it will take the new Board some time to be up to full operating speed, so members should allow the Board some space/time to establish itself. Peter Hartfield VK3PH has tendered his resignation from Publications Committee (PubCom) effective immediately, which means that we need to find a new Callbook Editor. You will find a call for Expressions of Interest elsewhere in this issue. Any questions regarding the role can be directed to either the Secretary of PubCom or to myself. Many readers will be aware that my main vehicle was destroyed by fire whilst undertaking a SOTA day trip back in September 2015. Since that time, I have been considering my options. My current vehicle has taken me to several summits but is not adequate for my needs/desires to get as close as possible to SOTA summits and into Parks. In mid-March I decided to purchase a new 4WD utility. I am currently working on fitting some radio equipment into the new vehicle; work which I am sure will occupy a significant amount of time over the Easter weekend. Then the fun will begin in assessing the RF compatibility of radios and vehicle! But at least I should be able to attempt some new summits which need more ground clearance on the access route. The new vehicle is much larger and heavier than previous vehicles, so it will take me some time to adjust to the vehicle characteristics. Parking certainly requires more care! 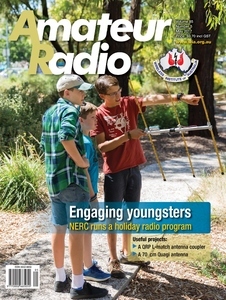 It will be around three weeks from the expected delivery date of this issue to the AGM weekend of activities in Hahndorf. I managed to chat on-air with one of the members of the organising committee in recent days. He advised that there around 200 people registered at that time. The program details have been updated, including information posted on Facebook. It looks like we will be in for a busy few days. I am planning a road trip, allowing me to tackle some SOTA summits and/or Parks during the trip to and from the meeting. I certainly look forward to catching up with friends and am certain that new friendships will be formed. See you in Hahndorf. Three eagle-eyed fox hunters taking part in the NERC Radio Showcase during the January School holidays. The multi-faceted event put Amateur Radio and technology to the fore. See the story commencing on page 20. Photo by Stuart Fillmore VK5STU. The WIA elections recorded the highest level of member participation in many years. According to the Returning Officer, John Marshall, more than 10,000 candidate votes were recorded from the 1500 voting papers submitted. I sincerely thank John Marshall and his team of volunteers for making this year’s election a very smooth and painless process. Six new faces were elected to the seven-director WIA Board - almost a clean sweep. WIA members have demonstrated a clear desire for change in a properly democratic process, and the new directors will take up their positions immediately following the AGM in Hahndorf, SA. The outgoing directors are very aware that members have spoken for change, and that the new Board will want to carve a path of its own, without being too constrained by the past. However, I am very pleased to say that all outgoing directors have indicated their willingness, if asked, to pass over their specialist knowledge and experience to the new Board, or to act as committee members. It will be up to the new Board to make that request. Obviously, the new directors will be on a steep learning curve, and they need to be given some time to master that often cantankerous animal that is the WIA. The WIA is a small but very complex operation, much more complex than most small businesses. Not only does it have to deliver a range of member services within a very restricted budget, and strive to satisfy increasing member expectations, it has to foster and maintain a strong high-level working relationship with government and the communications regulator. This is a dichotomy: on one hand, there is an increasing appetite amongst members for change and improved licence privileges, on the other hand, in the highly regulated radio communications sector; the pace of change is sometimes glacial. In short - we all need to temper our expectations and give the new Board a fair go. Through these President’s Comments I have tried to impress upon readers the importance of the social relevancy of amateur radio. I truly believe that amateur radio has an exciting future, provided it can change to meet new social and technological realities. The greatest threat I see to Amateur Radio is that technology and society will simply pass it by, leaving it a quaint remnant of the technological past, practiced by a few hardened enthusiasts. Just look around at the age profile at club meetings and you’ll get an idea of its trajectory. Conversely, the greatest opportunity I see is the new appreciation of the importance of science, engineering and technology in our education system, and the popularity of Maker groups. Introducing Amateur Radio to the Maker community has the potential to open up a whole new area of possibilities for Amateur Radio. It may not be mainstream Amateur Radio as we know it today - it may be more about using Amateur Radio as a tool to do other interesting things, but I think it’s a ‘no-brainer’. Makers are probably not going to come to Amateur Radio – Amateur Radio needs to go to them. Any amateur with microcomputer, mechanical or mechatronic experience should go join a Maker group, and promote the possibilities of Amateur Radio. This will likely be my last President’s Comment, or my last Comment as President, depending on who writes the next Comment which will appear after the appointment of the new Board. I have been elected as the only returning director from the outgoing Board, and my current ambition is to smooth the transition process as much as possible and then quietly retire. The sound of the ocean is calling. I will not be accepting any (albeit unlikely) nomination as President or Vice-President, and my recommendation to the new Board will be that this director position initially be made a one-year term , in order to re-establish the yearly cycle of half-Board appointments. I have very much enjoyed being President (well, not so much the past year). From what I have seen so far, it looks like the WIA will be in good hands. I would like to sincerely thank the WIA office staff, Bruce and Petra, for their continuing dedication to the WIA, and for putting up with me. Naturally, a big thank you goes to the outgoing Board and the many close advisors and volunteers that I have worked with on a daily basis. Many of who, quite frankly, have devoted way too many hours to the WIA, while at the same time, being forced to endure a level of public criticism and harassment that was quite over-the-top. I sincerely hope things will settle down and the new Board can spend its time productively rather than fending off constant negativity as has plagued the past year. So, just as the dolphins said in Douglas Adams’ ‘Hitchhikers Guide to the Galaxy’ when they departed Planet Earth just before it was demolished to make way for a hyperspace bypass – “so long, and thanks for all the fish”. I appreciate their philosophical view. PS: The Spectrum Strategy Committee will shortly be seeking formal views from the Amateur community of the WIA-proposed changes to the licence conditions. This survey exercise is to be an important component of liaison with the ACMA in creating a new LCD for the future. While the exercise will be predominantly conducted online via the WIA website, the Committee is aware that some stakeholders in the Amateur community do not have online access, or prefer not to use it. Accordingly, hard copy of the survey material can be requested from the National Office; just send a short note requesting the Licence Conditions Survey material and it will be sent to you when it becomes available. 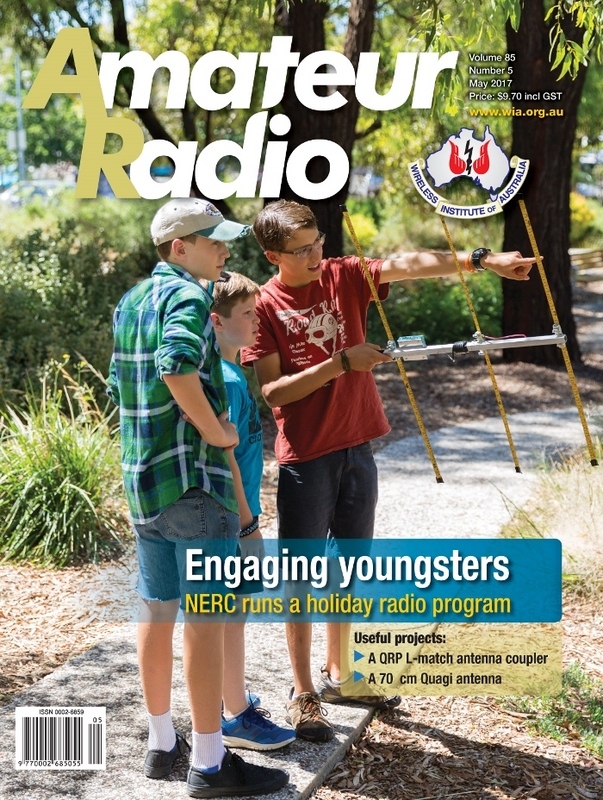 The authors outline a Technology Program run during the South Australian School Holidays in association with a local government Council. It was a successful engagement of many youngsters in several STEM activities. The author gives us an update of activities occurring at the WIA AM weekend. The author presents a simple L-match antenna coupler suitable for QRP use. The author outlines the development and construction of a Quagi antenna for the 70 cm band.